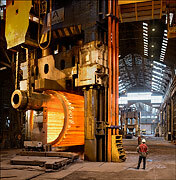 The first iron works the „Royal Foundry“ started production in Le Creusot, France in 1782. In 1836 Adolphe und Eugène Schneider took over the foundry and made it into the “French Krupp”, a factory producing speciality steels, locomotives, large weapons and machinery. In 1876 the largest steam hammer worldwide (100 ton) was installed at Schneider & Cie .The first hydraulik press starts production in 1890. In 1920 more than 20000 people are employed in the mill’s blast furnaces, open hearth shops, rolling mills, forges, foundries and mechanical shops. Iron production is closed down in 1940. From 1949 on the mills in Le Creusot are named “Société des Forges et Ateliers du Creusot (SFAC)”. 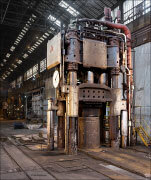 In 1952 a 7500-ton hydraulic press (a reparation from Germany) is installed. The first nuclear power plant equipment is produced in 1954. In 1970 the SFAC joins the “Cie. des Ateliers et Forges de la Loire” to form “Creusot-Loire“. A new 11300-ton press was commissioned in 1979. 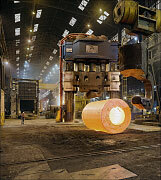 In 1984 Creusot Loire filed bancruptcy and the steel and rolling mills were taken over by USINOR to become part of Industeel later. 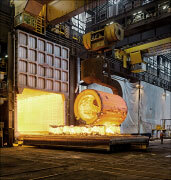 The forge and mechanical shops became part of SFAR Steel and were taken over by AREVA, world’s largest manufacturer for nuclear power plant equipment, in 2006. 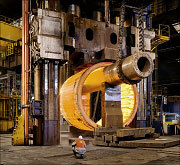 Today two forging presses, 7500-ton and 11300-ton, and two huge mechanical shops are in operation. 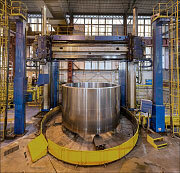 The old 7500-ton press will be replaced soon by a new 9000-ton press.